Avon Boating provides a fleet of traditional passenger vessels for private charter hire and extended cruises, buffets, river picnics which can create the ideal coporate event. 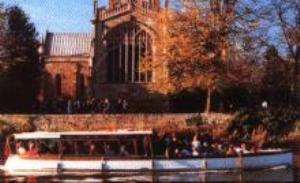 Your delegates can experience Shakespeare's Stratford whilst cruising along the River Avon. Drinks, canapes and finger food and a bar service can be provided on board. Rowing boats and self-drive motor boats are also available for hire. Our Boathouse is only a short walk for the Pay & Display carpark on Swan's Nest Lane. Nearest public toilets are behind The View Fish & Chip Restaurant. A 10% discount is offered off our standard rates for all group bookings. From Stratford town centre, cross over the road towards the river and go along Waterside. Avon Boating is on your left-hand on the river front within the Bancroft Gardens next to the Royal Shakespeare Theatre. Avon Boating Ltd is an outdoor visitor attraction. At no point do the general public enter a building. River bank is clearly marked. The general public are assisted in entering any water craft by trained staff members. Due to the nature of our boats we are unable to take wheel chairs aboard any of our water craft. Any body with the ability to leave their chair is assisted safely into the water craft. For further information on access please contact us on 01789 267073.